Beautiful 0.25 carats flush princess cut diamond set wedding ring created in an optional 4mm or 5mm flat court profile band. Five beautifully matched Princess cut Diamonds sit within this pretty Wedding Ring. The 2mm Princess cut Diamonds weigh a total of 0.25 carats and are expertly flush set into the flat court profile Wedding Band. The comfortable ring profile is available in a choice of 4mm or 5mm widths and can be finished in 18 Carat White, Rose or Yellow Gold, 950 Palladium or Platinum. 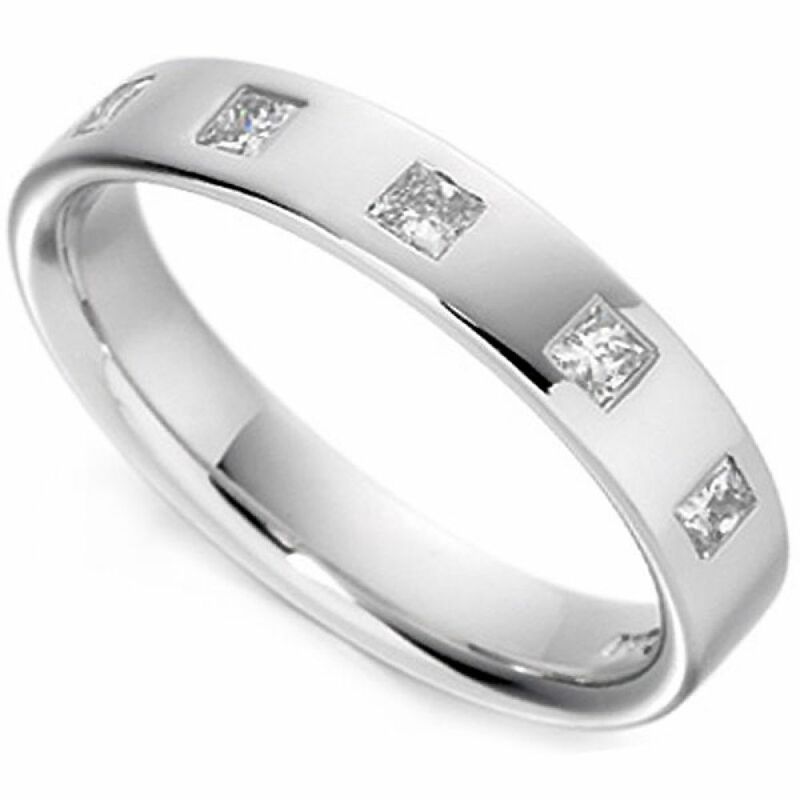 We are also pleased to offer this design in our fully ethical 18ct Fairtrade Gold options too. The diamonds have been graded G Colour and VS2 Clarity prior to being set into the Wedding Ring. This stylish design is crafted to order so please allow 4 weeks for delivery. The immaculately polished ring will arrive to you in luxury packaging, ready to celebrate your special day. All deliveries to Ireland are sent by International Signed for Mail, and take around 2 days to arrive. We notify you once your ring has been completed, and send you the tracking details as the parcel leaves. All items are fully insured until they arrive. Diamond wedding rings and diamond eternity rings are all elegantly presented in exquisite luxury packaging, safely held within a rigid main outer box under plain cover. Get expert advice and guidance from friendly experienced jewellery professionals to guide you in every step of your journey to the perfect ring. Request your free ring sizer? Complete our simple online form to receive a free ring sizer and we will confirm once this is sent straight out in a plain white business envelope same day.